Girard was born and raised in Marinette, Wisconsin, at the mouth of Green Bay. He was a star athlete in multiple sports, including baseball, basketball, and football, in high school. While still in high school, Girard received offers to play baseball for five major league teams. Instead, he enrolled at the University of Wisconsin in the fall of 1944. Girard gained acclaim for his play at the halfback position. Before playing his first college game he was touted as the greatest passer ever to play for the Wisconsin Badgers football program. He lived up to the hype, as he became a star player as a 17-year-old freshman. At the end of the 1944 season, he was selected by Look magazine as a first-team All-American at the halfback position. He was also selected by the undefeated 1944 Ohio State Buckeyes football team as the most valuable player on the teams that the Buckeyes played against. Girard's collegiate career was interrupted when he was inducted into the United States Army in April 1945. In November 1945, Girard was discharged from the Army, but reenlisted a day later to continue in the military for another year. Girard returned to the University of Wisconsin as a student in January 1947, and rejoined the football team for the 1947 season. In a November 1947 game against Iowa, he returned two punts for touchdowns, one return of 63 yards and the other 85 yards. Girard was selected by the Green Bay Packers with the seventh pick in the first round of the 1948 NFL Draft. He was also offered a $7,500 per year contract by the New York Yankees of the All-America Football Conference, indicating in early January 1948 that he intended to sign with that team. Two days later, Girard agreed to join the Packers for an undisclosed sum. Girard's mother refused to sign the contract with the Packers, and as a result Girard's formal signing with the Packers did not occur until his 21st birthday on January 25, 1948, at which time it was reported that he would be paid $8,000 for the 1948 season. He appeared in 10 games for the Packers in 1948, punting eight times for a 40-yard average. He also played for the Green Bay Packers basketball team after the 1948 football season. In April 1949, Girard was married to Joan Leddy. At the time, Girard was training in Florida with the Cleveland Indians minor league baseball team in Dayton, Ohio. Girard spent the summer of 1949 playing baseball for the Green Bay Bluejays, where he led the league with a .367 batting average, 122 hits, 34 extra base hits in 89 games. He was inducted into the Wisconsin State League Baseball Hall of Fame in 1952. In late July 1949, he signed a contract to return to the Packers, but was allowed to complete the baseball season with the Bluejays before joining the Packers' training camp. 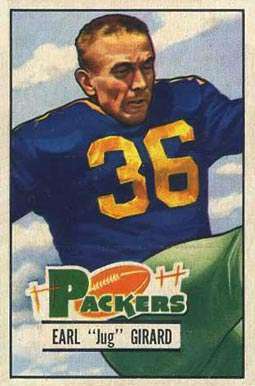 After a disappointing rookie season in 1948, Girard emerged as a star for the Packers in 1949. He led the Packers, and ranked eighth in the NFL, with 881 passing yards. He also ranked seventh in the NFL in passer rating, led the NFL with three blocked punts, rushed for 198 yards, and led the NFL with 69 punts, including a career-long 72-yard punt. He also ranked ninth in the NFL with 1,079 yards of total offense (881 yards passing an 198 rushing). In November 1949, Girard signed to play with the Oshkosh, Wisconsin, basketball team in the Wisconsin State Basketball League. He agreed to join the team at the end of the NFL season. In May 1950, he agreed to return to professional baseball, playing for the Cleveland Indians' minor league club in Cedar Rapids, Iowa. Less than a month later, Girard left the Cedar Rapids club, stating: "I've decided to give my full attention to pro football and give up baseball altogether. It's too hard on me to do both." One day after retiring from professional baseball, Girard signed a contract to return to the Packers for the 1950 season. That fall, Girard was limited to the role of punter, appearing in 10 games, none as a starter. He punted 71 times for an average of 38.2 yards per carry. In the summer of 1951, Girard made another attempt at professional baseball, playing for Wilkes-Barre in the Class A Eastern League. In July 1951, Girard signed his fourth one-year contract with the Packers. During the 1951 NFL season, Girard appeared in 12 games and punted 52 times for an average of 40.4 yards per punt. He also intercepted five passes and caught 10 passes, including two touchdown catches. On October 27, 1951, he caught four passes for 130 yards, including a 75-yard touchdown reception. In July 1952, the Packers traded Girard to the Detroit Lions in exchange for Ed Berrang and Steve Dowden. In Girard's first season in Detroit, the 1952 Lions won the NFL Championship. Girard appeared in 11 game for the 1952 Lions, several as a starting halfback, replacing Doak Walker who was injured in the second game of the 1952 season. In his first game as a Lion playing in Green Bay, Girard scored two touchdowns in a 52-17 Lions victory. Girard gained 538 yards from scrimmage and scored four touchdowns for the 1952 Lions, compiling 222 rushing yards and 316 receiving yards. When Walker returned to the starting lineup in mid-December 1952, Detroit head coach Buddy Parker said, "Jug Girard did a terrific job in place of Doak. There's nothing like having two top notch left halfbacks ready to go. Actually, I'd have a little trouble deciding which one to start. But since Jug's knee is banged up a little, the problem is settled. Doak will start." During the summer of 1953, Girard returned to baseball as the manager of the Kaukauna, Wisconsin, team in the Fox River Valley Semi Pro League. In late July 1953, Girard again signed to play for the Detroit Lions. He appeared in 11 games for the 1953 Lions, but his playing time was limited due to the return of Doak Walker to the lineup. Girard gained only 73 rushing yards and 24 receiving yards in 1953. Due to a knee injury, Girard was prescribed an "extra heavy right shoe" to wear during the 1953 season. In 1954, Girard helped lead the Lions to the NFL Championship Game for the third consecutive year. He became one of Bobby Layne's favorite targets, leading the team with seven touchdown catches. In all, Girard caught 27 passes for 421 yards in 1954. He also returned 12 kickoffs for 248 yards and punted 63 times for a 41-yard average. On December 19, 1954, Girard caught the game-winning catch from Layne with 50 second remaining in the game to defeat the Cleveland Browns in the final regular season game. Girard continued to play for the Lions in 1955 and 1956 as a punter and end. He gained 307 receiving yards in 1955, but his production fell in 1956. On December 2, 1956, Girard came into a game against the Chicago Bears on a fourth down play with nine yards to go. Girard lined up in punt formation, but he faked the punt and passed the ball 20 yards for first down to Dorne Dibble. It was his first completed pass for Detroit. Girard was dubbed "Mr. Versatility" in Detroit, having played for the Lions as an offensive end (left and right), halfback (left and right), punter, kickoff specialist, punt returner, kickoff returner, and some defense as well. In April 1957, Girard signed a contract with the Detroit Lions to play his tenth season in the NFL. However, in May 1957, the Lions sold Girard to the Baltimore Colts. Then, in September 1957, shortly before the start of the regular season, he was sold by the Colts to the Pittsburgh Steelers. During the 1957 NFL season, Girard played at left end and punter for the Steelers. He was the Steelers' #2 receiver, catching 21 passes for 419 yards and four touchdowns. He also punted 68 times for a 40.5 yard average. Girard announced his retirement from football in 1958, but then attempted a comeback with the Steelers in August 1958. Girard lived in the Detroit area after retiring from football. He ran a bar called "The Lion's Den" and later worked as a manufacturer's representative. He died in Rochester Hills, Michigan, in 1997, at age 69. 1 2 Walter Johns (October 26, 1944). "Wisconsin Star, Jug Girard, Lives Up To Advance Rave Notices -- And How!". The Evening Independent. p. 17. ↑ Hal Sayles (1944-11-30). "Speaking of Sports". Abilene Reporter-News. ↑ "Bucks Honor 'Jug' Girard". The Evening Independent. November 30, 1944. p. 18. ↑ "'Jug' Girard Inducted Into Army". The Rhinelander Daily News. April 24, 1945. p. 6. ↑ "'Jug' Girard Back Into Army for a Year". Monroe Evening Times. November 8, 1945. p. 5. ↑ ""Jug" Girard Enrolls". Monroe Evening Times. January 22, 1947. p. 3. ↑ "Jug Girard Badger Star". The Lincoln Star. November 2, 1947. p. 13. ↑ "Wisconsin Pins Title Hope On Flashing Backs: What Can Michigan Do About Jug Girard? Is Question of Week". The Circleville Herald. November 11, 1947. p. 7. ↑ "Badger Prepare for Game With Michigan Wolverines". November 10, 1947. p. 8. ↑ "Jug Girard of Badgers Is Drafted by Packers". The Milwaukee Journal. December 21, 1947. ↑ "Jug Girard Signs With Yankee Club". The Winona Republican-Herald. January 10, 1948. p. 8. ↑ "Packers Sign "Jug" Girard". Janesville Daily Gazette. January 12, 1948. p. 11. ↑ "Jug Girard To Play Pro Ball". Tucson Daily Citizen. January 27, 1948. p. 12. 1 2 3 4 5 6 7 8 9 10 11 "Jug Girard". Pro-Football-Reference.com. Sports Reference LLC. Retrieved July 10, 2015. ↑ "Packers Coming to Play Hardwares, Who Plan To Put Clamp On The 'Jug'". The Escanaba Daily Press. January 15, 1949. p. 10. ↑ "Jug Girard Is Wed To Kaukauana Girl". The Escanaba Daily Press. April 21, 1949. p. 14. ↑ "Two Added to State Loop Hall of Fame". The Rhinelander (Wis.) Daily News. January 24, 1952. p. 14. ↑ "Packers Sign Girard". Waukeha Daily Freeman. July 26, 1949. p. 2. ↑ "Oshkosh Signs Girard". Ironwood Daily Globe. November 15, 1949. p. 10. ↑ ""Jug" Girard Signs with Cedar Rapids". the Terre Haute Tribune-Star. May 28, 1950. p. 46. ↑ "Jug Girard Quits Cedar Rapids Again -- For Good, He Says". The Decatur Herald. June 16, 1950. p. 30. ↑ "Jug Girard Signs Pro Grid Pact With Packers". The Decatur Herald. June 17, 1950. p. 10. ↑ "Jug Girard Signs Packer Contract". The Rhinelander Daily News. July 26, 1951. p. 12. 1 2 "Jug Girard Is Traded to Detroit". Janesville Daily Gazette. July 26, 1952. p. 10. ↑ "Green Bay Packers 29 at New York Yankees 27". Pro-Football-Reference.com. Sports Reference LLC. Retrieved July 11, 2015. ↑ "Packers Rally, Defeat New York Yanks In Last 11 Seconds of Contest, 29-27". La Crosse Tribune. October 29, 1951. p. 11. ↑ Harry Stapler (November 4, 1952). "Both Walker, Jug Girard To Play Sunday". The Owosso Argus-Press. p. 8. ↑ "Lion Star Hurt; 'Jug' Girard May Be Swing Halfback". Oshkosh Daily Northwestern. December 2, 1952. p. 13. ↑ "Lions Pound Packers, Take Second Place: Hoernschemeyer, Girard Score Twice Each in 52-17 Rout". The Owosso Argus-Press. October 27, 1952. ↑ Harry Stapler (December 13, 1952). "Doak Walker Back to Pace Detroit Lions". Altoona Tribune. p. 12. ↑ "Girard Will Manage Semi-Pro Ball Team". Janesville Daily Gazette. April 30, 1953. p. 8. ↑ "Pat Harder signs with Detroit 11; So Does Jug Girard". The Post-Crescent, Appleton, Wis. July 23, 1953. p. 26. ↑ "Jug Girard To Wear Extra Heavy Shoe Next Grid Season". The La Crosse Tribune. February 24, 1953. p. 13. ↑ "Detroit Prepares for Title Defense". The Holland Evening Sentinel. December 21, 1954. p. 2. ↑ "Girard Rubs It In, Hurls Pass on Fake Punt Play". Toledo Blade. December 3, 1956. p. 20. ↑ "Versatile Jug Girard". East Liverpool (Ohio) Review. March 25, 1957. p. 13. ↑ "Lions Sign Earl (Jug) Girard". The La Crosse Tribune. April 7, 1957. p. 19. ↑ "Lions Sell 'Jug' Girard To Colts". Daily Independent Journal. May 9, 1957. p. 14. ↑ "Steelers Buy Jug Girard". The La Crosse Tribune. September 11, 1957. p. 25. ↑ "Jug Girard Comes Out of Retirement". The Terre Haute Tribune. August 23, 1958. p. 6. ↑ "Tales from the old-time: Earl "Jug" Girard". Peshtigo Times.